Jack Bell Gallery is pleased to present an exhibition of new paintings on canvas by contemporary artist Armand Boua. In his fifth solo show with the gallery, Boua takes the street kids of his hometown as subjects for a powerful set of portraits. ‘I wanted to show their suffering, their way of life’, he says, ‘so that people are finally aware of this painful reality they pretend not to see’. The artist is noted for his textured compositions, building up layers of acrylic and collage. Each layer is applied and then scrubbed and stripped back, leaving abstract forms that come in and out of focus. Boua achieves a careful balance between his heavy gestures and violent execution and the gentle treatment of his subject matter. Boua was born in 1978 in Abidjan, Ivory Coast, where he continues to live and work. His work is in the permanent collection of the Minneapolis Institute of Art. 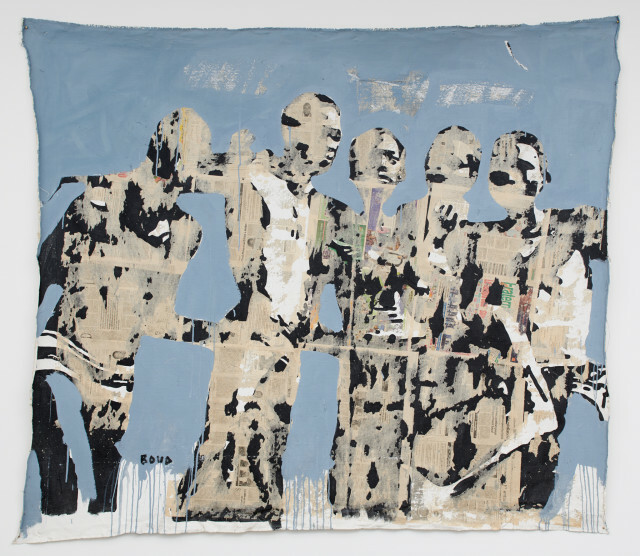 Exhibitions include ‘Pangaea II: New Art From Africa and Latin America’, Saatchi Gallery, London, 2015.